Does SEO Rankings Still Matter? Nearly every SEO conversation must involve ranking. But, is number one ranking crucial? What about generating new leads and sales? Well, most applications focus a lot on ranking. However, could you be ignoring the essential part of customer acquisition process? We know that there is a considerable ranking space present in search engine results, and thousands of companies desire the same area. The old era of SEO targets a site to attain the highest position possible with the help of many keywords and meta tags. Keep reading to discover whether number one SEO ranking is essential nowadays or not. The traditional SEO practices aim to achieve the number one position for statistical reasons. For example, the first position of a particular SERP gets around 32.5 percent of search traffic, while the second and third position receives 17.6, 11.4 percent respectively. Does number one ranking still matter? Whether it’s a yes or no the truth is number one ranking has fallen in priority when it comes to SEO. It’s becoming less relevant and desirable over time. Companies have started to realize that the goal isn’t just about ranks and clicks. Generating leads and sales should be the primary goal. Increasing search traffic can increase leads, but it’s not a guarantee. Here are other reasons for the fall of SEO ranking. The success of SEO depends on the keyword target. If you could get a collection of keywords that have a high traffic and little competition, then you could dedicate all your resources and be sure of a first rank. Nowadays, keywords are still essential, but there is the rise of semantic search. It’s then hard to specifically target a single phrase. Google algorithm always attempts to match the exact user query phrase with the most appropriate content instead of content with the highest text matches. Seo ranking and traffic are essential, but the critical element should be the value the visitor returns to your brand. If the visitors to your site don’t take any action with your niche, then it’s not important how many times you rank first. 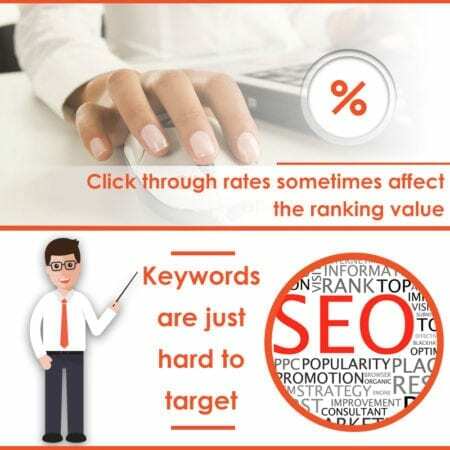 The click-through rates have a specific relationship when it comes to SEO ranking. There is a relation between highest rankings and CTR. However, the association appears mutual. The higher your site ranks the higher the number of CTRs you receive. Beside this, you must also remember that first ranked position may still not imply a high CTR. You need to optimize your site metadata so that it’s appealing to users. If there is something unique about semantic search is that it lets your content get more links and ranks for keyword phrases that you didn’t target. As long as you create high-quality content, your site becomes easy to rank for any keyword. I know you are now asking yourself the same question. Perhaps you have a plan to abandon the old SEO strategy. Ok, the best thing you should realize is that the landscape of SEO is slowly changing. There are cases that it’ll be valuable to use keywords to rank first. Other times, you may not need to focus on keywords. Instead, create quality content, and you’ll enjoy success. Your favorite strategy should be to find a way where you can combine both approaches and highlight some of the relevant elements of your brand. If you do this, you’ll boost your rank and the value of your niche. I’ve recently came across a Linkio.com website. This is a product which helps SEO teams to plan SEO campaign strategy and also provides better online rankings management for your website.